Last weekend saw further clashes between residents groups and police over the beginning of mining operations. 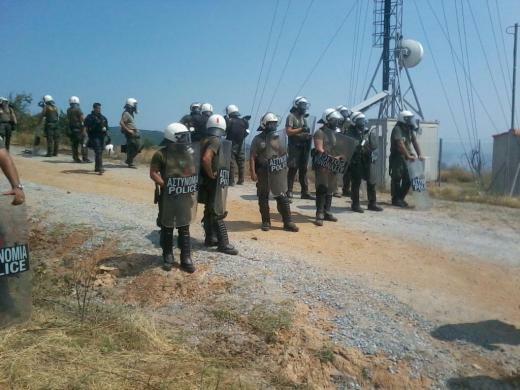 Over the weekend there were further protests against the start of mining works around Skouries in northern Greece. Hellenic Gold, a part of the Eldorado mining company has been given permission to mine gold in the area. This would involve cutting down part of the forest which the mining site occupies. Whilst the company are saying that the mine will create jobs and bring investment into Greece local residents claim the activity will cause damage to the environment. The Greek state has already given approval to the mining activity and parts of the forest are being cleared. In a time of economic crisis in Greece the mines are being presented as a welcome foreign investment and job creator. The damage to the environment, which apart from the clearing of the forest also threatens water supplies, has been brushed aside. In response local residents have been organising assemblies and protests against the mines for several months, with the most recent having been this past weekend. These protests have often led to clashes with the police around the mining area. These clashes have resulted in the use of tear gas and rubber bullets as well as arrests. The presence of people opposed to the mining during a recent large anti-austerity protest in Thessaloniki demonstrates that this struggle is part of the wider Greek crisis. In some ways the response to the mining in Skouries echoes the struggles seen in the town of Keratea since 2010. Local residents of Keratea opposed the building of a landfill in the area which would again have damaged the local environment. The residents struggle led to frequent clashes with the police. At times the police conducted large invasions of the town as residents dug up the roads and attacked machinery needed for the work. Subsequently work was halted as it was too difficult to maintain the necessary police presence. As the Greek state is desperate for money and investment it's likely that work at the mines will continue and other potentially environmentally damaging projects carried out. Without resistance to such acts the Greek environment could suffer during these crisis years.